SusieQTpies Cafe: Wake up lunch time with Rice Krispies Treats! Most kids in America have been back to school for almost a month now. Parents, children and teachers have establish routines that will last until school is let out for the summer. Some routines are welcomed and necessary whereas other routines become boring and incessantly repetitious. What routines are boring the socks off of you and your school-aged child??? The routine that seems to bore most children is lunch time! Monday through Friday they open their lunch kit to find the same type of sandwich, fruit cup, granola bar, bag of chips and a little sweet treat to eat at the conclusion of said meal. Most kids skip the sandwich and eat the sweet treat first. Mom and Dads aren't around to reinforce the eating order so most grab the sweet treat first! Really, lunch time is a quick 20 minutes so who has time to waste it on a sandwich when dessert should be first! If this is true, as parents, we should capitalize on our child's sudden burst of independence and make this little treat worth their minute of rebellion! As a parent we should embrace this act of rebellion and seize the moment!!! What type of treats can you put in their kit to jazz up their lunch and make them feel like they are doing a good thing by eating their dessert first?? 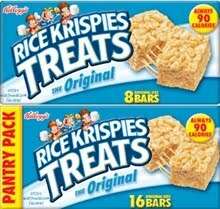 One treat that comes to mind is anything made with Rice Krispies! This is a quick and easy go to snack! Check out our Sushi Treats! Another resource is their website. You will find a plethora of quick and easy snack decorating ideas that require a batch of Rice Krispies and a few other ingredients that you most likely have on hand. Some of the easiest ideas involve using cookie cutters to give shape to the treats! When packing school lunches think "holidays". You can't go wrong with holidays! Since Fall and Halloween are upon us, use leaf, pumpkin, ghost,etc cutters to make a quick and easy snack for their lunch kit. If you have time to decorate, use fruit snacks (pieces, rolls, etc) to add some character to each snack that you put into their kit! Peanut butter works great as "glue" to get the fruit stack pieces to stick to the Rice Krispie Treats. Now that we homeschool, I've had to really think about things that I can do to jazz up our home lunch and snack routine. Instead of making the fun snacks myself and sticking it in their lunch kit, we make the snacks together. I love the new packages of Rice Krispie treats! What a fun way to add some pizazz to our daily routine. Here are a few more that I wrote on as reminders to what was coming up next or what was expected of them! Thanks to Rice Krispies, you now have a fun way to break up the lunch kit routine and send a fun snack with a meaningful or random message to give them a little taste of home in the middle of their day! If they are going to snack first, take advantage of having their undivided attention and let them know you are thinking of them! I was asked by Kellogg to participate in this blogging program. I was compenstated for my post and given a box of Rice Krispies to review. This in no way influenced my words expressed in this post. Now go grab a box and experience the fun for you and your children! What fun! I wish these had been available when my kids were little. Maybe I should go stock up and write notes for my grandchildren. Thanks for sharing. I am entering the 50.00 gift card and wanted to leave you a post. a great idea to be able to write little notes. A pick me up to eat and pick me up for the soul! I remember loving handmade Rice Krispie treats as a kid, but these are so much more convenient and no mess to clean up!